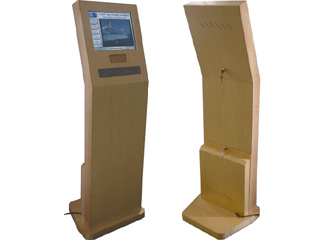 i-Touch V25 Slim-Line Wooden Floor standing kiosk with 15'' screen - Future Generation Kiosk Products. The Wooden Kiosk unit is designed for in environments where aesthetic appearance is paramount. With the wide range of wooden finishes, this traditionally designed unit would sit perfectly in the lobby of a five-star hotel.